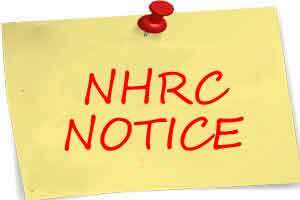 The National Human Rights Commission (NHRC) has taken suo motu cognizance of media reports about the deaths of more than 80 infants/children at a government-run hospital in the district Banswara of Rajasthan during the last two months. It has issued a notice to the Chief Secretary, Government of Rajasthan calling for a detailed report in the matter within four weeks along with the steps taken and proposed to be taken to improve the conditions in the hospital. He has also been asked to inform whether any instructions in the recent past have been issued to the hospitals and other Medical Care institutions sensitizing them to be attentive and careful to prevent such tragic deaths due to any human errors/negligence. Taking serious exception to the reported poor facilities and upkeep of the hospital, the Commission has observed that the negligence on the part of the hospital authorities amounts to the violation of the right to life of the poor victims. Many such cases from various parts of the country have come to the notice of the Commission, wherein a large number of human lives are lost due to the lack of infrastructure and callous attitude of the doctors/officers in the government run hospitals. According to the media report, carried on the 5th September 2017, the ‘Labour Room’ of the hospital was not properly sterilized and even the towels, being used, were found to be dirty. There was no proper sanitation in the Labour Room. The pregnant women were found to be underweight and proper consultation regarding appropriate diet was not being provided to them by the hospital. No proper records were being maintained due to weakness, they delivered babies at premature stages and the infants suffered lung diseases leading to their deaths. Reportedly, the State Government has suspended the Chief Medical Officer, Gynaecologist, and the Block Medical Officer. Apart from this, 6 doctors have been issued Show Cause Notices and 6 others have been removed from the service.